We were pretty sure we should be focusing on entrepreneurship tools. Software someone would use to understand and learn about start-ups and early business. The secret to getting rich during a gold rush is to sell pickaxes and shovels not dig for gold. Following the same concept we came up with the content management for accelerators idea which seemed more like a business canvas editor on steroids. We even came up with a marketplace approach within a couple of iterations. Which was definitely a smart way of delivering such content for our users. 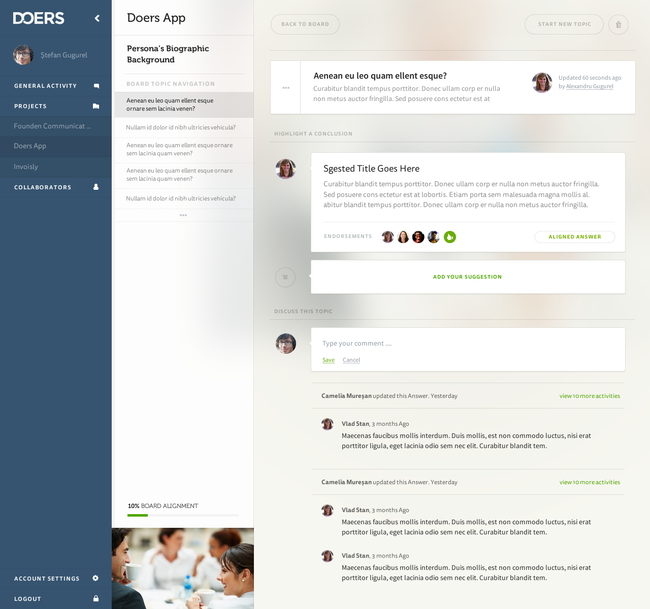 DOERS v1 was shipped by the end of May. V2 was deployed late August. And while Techpeaks event in Trento was a great opportunity to confirm dogfooding is good, we understood that what we are building if just fun and nice to have. And that San-Francisco wouldn’t buy DOERS the way it was back then, actually no one would. September was all about product development. Collaboration was what our product was missing, and it was what we were working hard to get right. This might have sound naive back then, but collaboration/communication is actually the only thing we should have cared about. We got that only later. By the end of October, early November we shipped discussion support for our boards. This also included an immense shift to a new direction where the major features were bringing our tool closer to decision making and workflow management rather the initial positioning. Some sort of Discourse for enterprise if I may. October was a full month. In order to prepare for the fundraising we had to decide who are we and what do we want to do. The old investment fund entity was by far the last title you want to keep on the business card when asking for money from a VC. This and the fact that the only thing left from Geekcelerator was our team and some seed money, made it even less worth keeping. Geekcelerator had to go. The official announcement was published in December, although we were Founden for already two months. Our investors were updated and Founden was creating tools for entrepreneurs. The purpose of our travel to San-Francisco was exclusively customer validation and fundraising for the new entity. After less than a month there, this led to another shift in product. Too generic, too little market, not too challenging to be worth an investment, is what we’ve been told. We had money until December, which was like two more months we could only afford. Due to the lack of any news lately, we experienced a big moral breakdown in November. This paid an important role in the development of the next events in our product. By looking back at the whole knowledge and experience we gained while working on the collaboration aspects, there was one common goal in the purpose of every iteration: simplified communication. Without realizing this, we were fixing different aspects of nowadays communication challenges, most of which are due to e-mail limitations. Inspired by the work on Google Wave, the next two months was what we were calling v4. 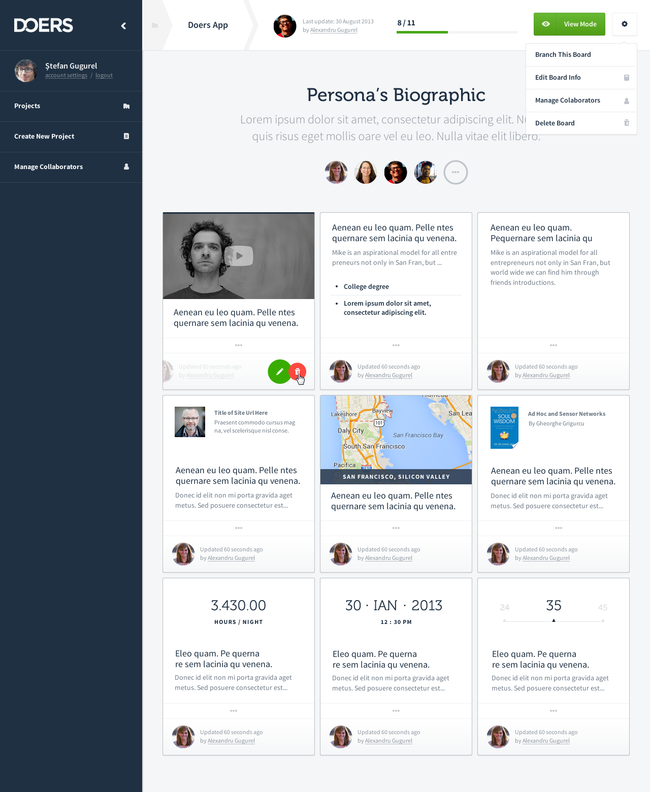 V4 is a conversation based communication tool taking a shot to offer a solution for most of what is listed above. In December we were fully aware only a miracle could save us. We kept working for another two months hoping we will find a solution to keep up the development. But it didn’t happen. I also realized that Founden v4 was by far one of the most exciting and challenging project I had a chance to work on by that time. My unicorn job. Some time ago the unofficial closing of our venture was announced. With this article I would like to express my deepest respect for everyone who worked with us for the last months. Many thanks to the people who invested in us and trusted us. Thanks and sorry to people who had to leave us while walking our way down here (Sabin, David). And all the best to my team in their future journeys: Alex, Andreea, Cătălina, Ștefan and Vlad. Both Doers and Founden v4 are worthless without a future, a future we could not provide. So we decided it would be a fair thing to share our work with anyone who is thinking to attack the same problems we did, or who is working for the same market we did (cough cough Slack, Hipchat, Hangouts…). We published all our work on GitHub under MIT license. We hope somebody will find it interesting some day.